In 2005 Howard County received a grant to support development of Watershed Restoration Action Strategies. The Rockburn Branch was one of two subwatersheds of the Patapsco River that was selected for further assessments. 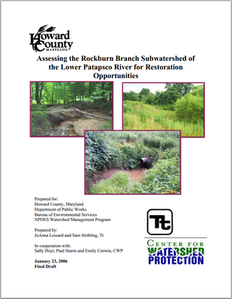 Out of that came a 51-page report titled Assessing the Rockburn Branch Subwatershed of the Lower Patapsco River for Restoration Opportunities.